On Saturday October 13th I attended the final night of the Mountain High Tour at the Hollywood Bowl. On the bill was Dierks Bentley with Brothers Osborne and Lanco. I have been to a lot of concerts and shows and this is definitely in my top 5! It was incredible! There was several of cool moments throughout the night. The night began early with a short set by the Hot Country Knights and they were a blast! In all of the shows I’ve been to I have never seen anything like this! All bands on the bill came together for a very funny “tribute” band. Dierks Bentley, Brothers Osborne and various band members joking, playing and singing was a great idea and a lot of fun. They even threw out tons of guitar picks with the band’s name. Next up was Lanco, a band who’s music I am not familiar with. I thought they had great energy and seemed genuinely excited to have been a part of this tour. Brothers Osborne does it again. They top themselves every time I see them perform live, this being the 7th time. The magic never goes away. During “21 Summer” there was a moment where all my love of country music came flooding back to me. The perfect band. The perfect night. The perfect song with the band in sync. I remembered why I love music in general and why I continue to go to concerts. Why I continue to listen to the same songs and bands over and over. It’s magic. Every time I see John perform I always think of his guitar as an instrument he uses to talk to the audience. It’s as if he’s speaking words that maybe I can’t understand, like a foreign language, but I can FEEL what he is expressing. That is a gift and it has to be rare because nobody does it like John Osborne. “Stay a Little Longer” is always a potent song to see them perform live and truly showcases the musical talents of TJ and John Osborne. I had seen Dierks Bentley once before at the 1st Route 91 Harvest Festival (also the 1st time I saw Brothers Osborne as well). He has a lot of great songs and I like the guy enough but I was not prepared for his show! Dierks has so much energy that it was difficult getting pictures of him. He constantly moved around, interacting with the band members and the audience. He must have gone into the audience 3 or 4 times throughout the night, something I have never experienced. I was completely blown away by Dierks Bentley and am extremely happy I was to attend this concert! At one point Dierks brought surprise guest Dwight Yoakum on stage for a song, during which the Brothers Osborne returned to the stage as well. Everyone was excited to perform with Dwight, I’m sure he’s one of their musical idols! Dierks also brought the lead singer for Lanco back on stage in the middle of “5150”. Throughout the night all bands came on stage at various times, including the Brothers Osborne for “Burning Man”. Prior to singing “Drunk on a Plane” a retro style video was shown on the jumbo screens with flight attendants. Then the stage lights turned on to reveal Dierks in full captain costume on top of the lighting rig, swaying around as if he was flying a plane! A lot of thought clearly went into planing this tour! This was definitely a concert I’ll never forget! So many special moments but all the bands were tight and sang great. There was a lot of energy, laughs and a few emotional moments. 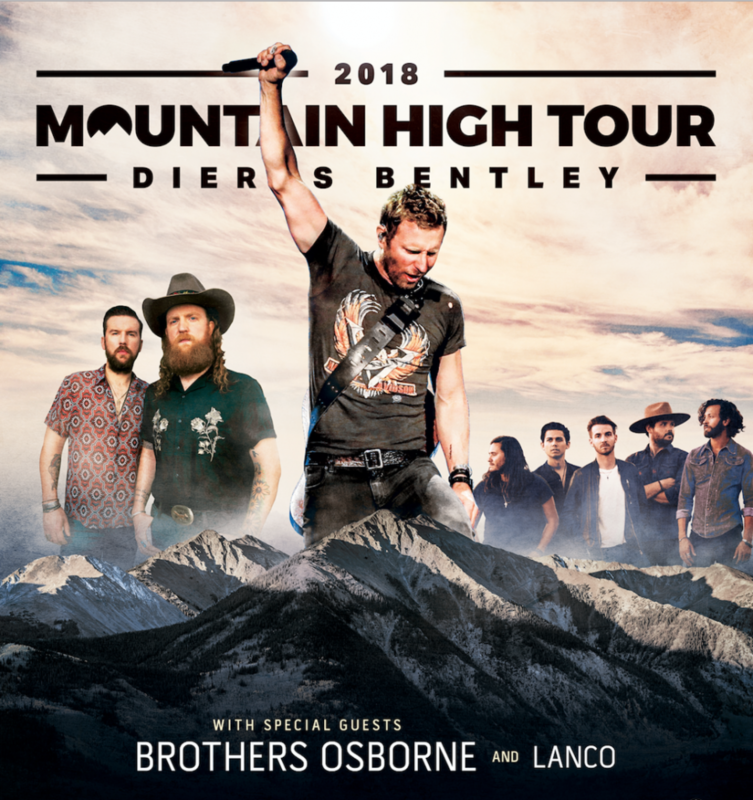 Thank you Dierks Bentley, Brothers Osborne, Lanco and of course Hot Country Knights. You all rocked the Hollywood Bowl!